It was on the 12th of September, 2013 that Google announced that the link data within Google Webmaster Tools is going to get much broader and extensive cross-section of links. For the convenience of the webmasters, Google Webmaster Tools will now offer specific details on the number of impressions and the clicks that your website gets from a particular search. For all those webmasters who are more dependent on mobile traffic, there will be a new filter that will be of particular interest to them. With the algorithm updates of Google, there have been certain specific changes to the way in which webmasters deal with their websites so that they’re not penalized by Google. Read on the concerns of this article to know more on the ways in which you can use the new search queries of Google Webmaster Tools. Google Webmaster Tools usually shows you link in an alphabetical order, exported in lexicographical order, but with the new changes, Google will now show you sample links uniformly from the wide variety of backlinks instead of showing them to you alphabetically. According to Google, this will certainly be a more diversity in your links, thereby showing you links from different TLDs or Top Level Domains and from other different domain names. 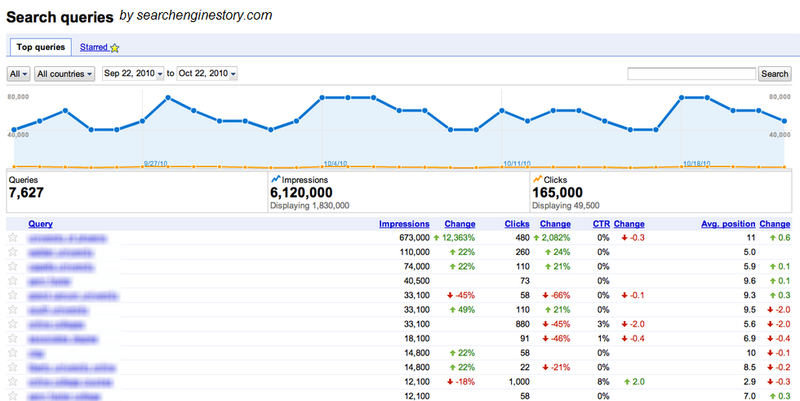 The largest number of links Google will export from Google Webmaster Tools is going to be around 100,000 backlinks. Well, that won’t change. What has changed is the kind of links that Google is showing you in that export. Through this change, the webmasters will be easily able to clean up all bad linking practices as they can now have a better overview of those links. No more rounding of search queries? Previously, Google had the habit of rounding up click data and impression. Even at times, Google wasn’t just rounding up to the nearest thousand but even to the nearest million, through which the webmasters gained impression that their website would perform better or worse. But with the changes, you can see specific data right down with a single individual click or impression. Google has high hopes that a better specific data will help information be more accessible and actionable for webmasters. The statistics for search query for both mobile and desktop can easily be displayed through the Google Webmaster Tools rather than being summed up together. The users generally interact with websites in a different way when they check out websites on a desktop or a mobile device. With the changes to the Google Webmaster Tools, the webmasters can determine when there are any problem areas while using a website through a mobile device. The usage of mobile devices is becoming increasingly important with days. Traffic from the mobile devices usually continues to climb and therefore having a specific and detailed information search queries will be extremely helpful. Leverage the multiple benefits of the Google Webmaster Tools and help build better traffic for your website.